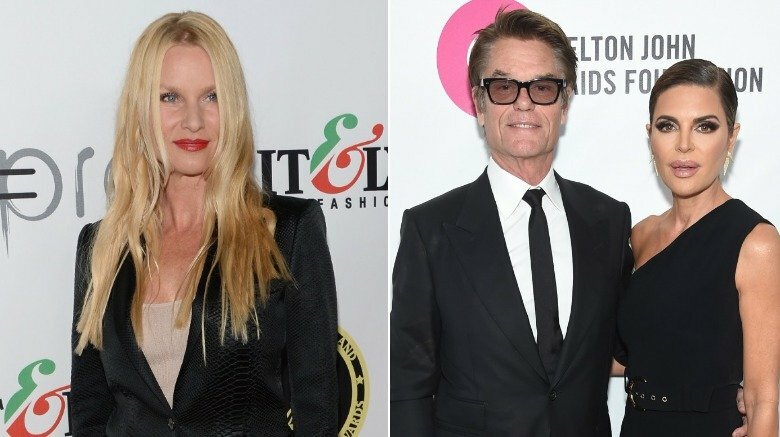 Unless you've been keeping up with all of the juicy gossip sites out there on the web, you may be wondering what exactly happened to Nicollette Sheridan. As of this writing, the English-American actress has been largely MIA, despite becoming a household name in the early 2000s. Sheridan, who got her start as a soap star, struck it big when she landed a leading role on Desperate Housewives in 2004. For a handful of years, she seemed to be everywhere, along with her Wisteria Lane neighbors, Eva Longoria, Felicity Huffman, Teri Hatcher, and Marcia Cross. Then, almost out of the blue, she got killed off the series in 2009 (the show went on without her until 2012) and disappeared. She told Entertainment Weekly the experience was "degrading and demoralizing." The blonde beauty made a brief return to the small screen in the 2017 reboot of Dynasty, but otherwise, both her personal and professional pursuits have been rather lackluster. Here's the real reason you don't hear from Nicollette Sheridan anymore. When Nicollette Sheridan was killed off of Desperate Housewives in 2009, she was so mad she sued ABC and show creator Marc Cherry. According to Sheridan's claims, Cherry hit her, and when she complained, he fired her by writing her off the show. After an array of allegations were dropped or dismissed, Sheridan eventually took her former bosses to court for "wrongful termination and battery," The Hollywood Reporter confirmed. The altercation allegedly took place during a September 2008 rehearsal in which Sheridan confronted Cherry over her dialogue. "Mr. Cherry stepped toward me and hit me upside the head," she testified (per the Daily Beast). "It was a nice wallop across the head. I was stunned. I couldn't believe he just hit me. I looked at him, and I could tell he was stunned." While Cherry testified that he only "tapped" her while showing her how she should hit her husband in the given scene, the actress claimed that her complaints about his behavior got her fired, and that Eva Longoria, Felicity Huffman, and the show's writers were told of her departure two months before her. The case eventually "ended in a mistrial when the jury deadlocked," Deadline reported. A slew of appeals and motions for retrials followed and, in 2017, a judge tossed out her case, noting that Sheridan could not "prove that she made a complaint of unsafe working conditions," or that her character's death wasn't simply a creative decision. Life often imitates art and that was certainly the case on the Desperate Housewives set. Behind the scenes, the ladies did not get along at all. A prime example was their 2015 Vanity Fair swimsuit cover shoot. As the magazine's cover professed, "You wouldn't believe what it took just to get this photo!" Things were so bad that ABC appointed a rep to handle the ladies on-set and give out orders such as, "Do not let Teri [Hatcher] go to wardrobe first," Today reported. Although she wasn't alone in her behavior, Nicollette Sheridan wasn't worried about making enemies on the show. She once called Teri Hatcher the "meanest woman in the world," according to show creator Marc Cherry's testimony in Sheridan's aforementioned lawsuit (per E News!). And, as the Daily Beast learned, "There were daily fights about the size of trailers and the prominence of scenes, and it all quickly devolved into a middle-aged version of high school, with the ladies breaking up into cliques." When Sheridan eventually left the show, Felicity Huffman didn't spend any time mourning, instead moving into Sheridan's trailer. Sheridan also openly complained about creator Marc Cherry's demands. As executive producer George Perkins testified (per the Daily Beast), she openly voiced her disapproval, telling him "her call time was too early and she wasn't needed as early as we called her." Before agreeing to join the cast of the Dynasty reboot in March 2018, Sheridan had been away from the mainstream spotlight for a whopping nine years. A decision that was influenced by her drama-filled exit from Desperate Housewives. Speaking with Entertainment Weekly in 2018, the actress made it clear that the incident was still very much on her mind, recalling, "I was the victim of assault and battery on the set of Desperate Housewives by the creator of the show, my boss. I reported him and was retaliated against for doing so and fired. That is against the law." She continued, "I was vilified for standing up for my rights, not only as a woman but as a human being. And I was punished for it." She went on to reveal that the incident tainted her perception of Hollywood. "It sent me under a rock," she told the outlet. "I really grappled with what happened, losing faith in people and really not trusting the business at all. I didn't know that I wanted anything to do with the business for some time." Finally, it was the #MeToo movement that inspired her to give it another chance. "I was flipping through the channels and I heard somebody talking about what had happened and it was like this weight lifted off my shoulders because I didn't feel alone," she said. "It is so empowering to not feel alone and to hear other stories. It really helps." 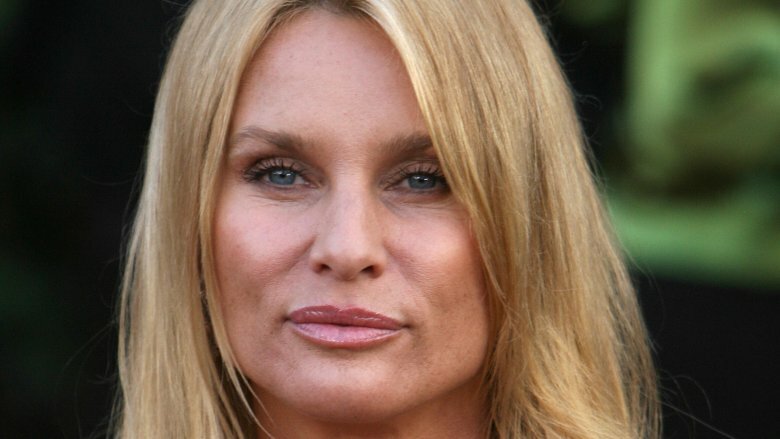 Nicollette Sheridan has quite the connection to The Real Housewives of Beverly Hills. Not only was she once married to Harry Hamlin, who then wed Lisa Rinna, but she was also hitched to Aaron Phypers, who went on to marry Denise Richards. The ladies were discussing Sheridan when Rinna (who married Hamlin in 1997) told viewers, "Harry was married to her 30 years ago. The story is, she went to a Michael Bolton concert at the Hollywood Bowl." Asked if Sheridan left with the "Said I Loved You But I Lied" crooner, Rinna said, "F*** yes. Harry was in Canada." Sheridan wasn't impressed. Tweeting the clip from the show, she wrote, "FAKE NEWS! Harry and I ended our marriage nose to nose in Canada…Michael was a long time friend that was invited to our wedding…Happy Harry found happiness with housewife @lisarinna." That's when Hamlin jumped in, tweeting, "Re Fake News! What's it called when your wife of one year suddenly goes to bed with a pop singer? … two weeks after your mother dies?? I did a lotta stuff with my wife "nose to nose" but ending our marriage was not one of them!" Rinna added one more blow on Instagram Stories [via ET Canada], writing, "My bad, I'm sorry, Nicollette. I forgot to thank you also. Thank you for f**king Michael Bolton and cheating on Harry while married. I thought I'd take the high road and not tweet this… NAH." 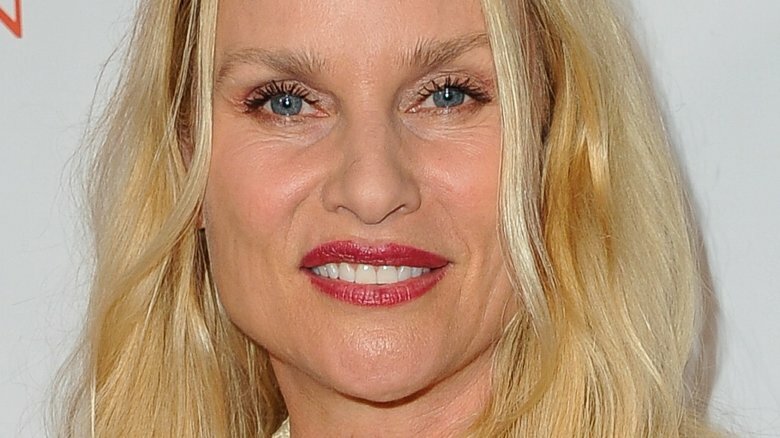 Nicollette Sheridan tied the knot with Aaron Phypers on December 12, 2015 only to call it quits six months later on June 19, 2016. Despite the quick split, however, the couple's divorce wasn't finalized until much, much later in August 2018, People confirmed. 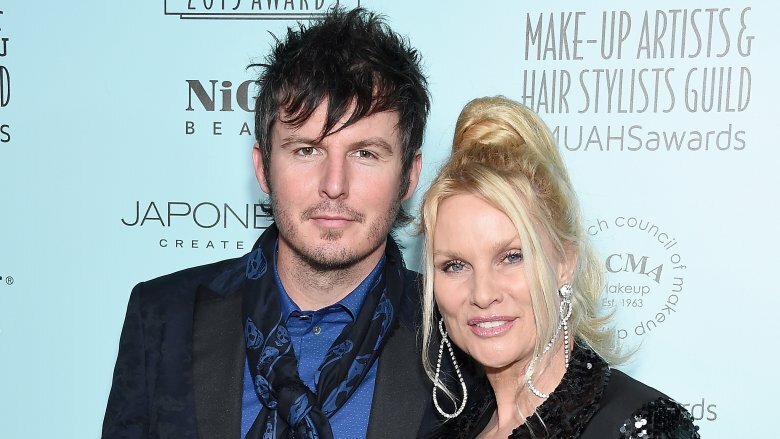 Although their separation wasn't filled with drama in the legal sense — neither one asked for spousal support and both walked away with their personal belongings — the split did land Sheridan in the news because of her ex's rebound. The news resulted in snarky headlines, like TMZ's "DENISE RICHARDS, HE'S ALL YOURS!!!" and MSN's "Nicollette Sheridan officially divorced from Denise Richards' boyfriend." Just two weeks later, in September 2018, Phypers wed Denise Richards (the nuptials aired on an episode of The Real Housewives of Beverly Hills in March 2019). As for Sheridan, she was first spotted lunching with a much younger mystery man in September 2018, as the Daily Mail documented, then the pair made their red carpet debut in February 2019. While her new beau has yet to be identified, as of this writing, it doesn't sound like Sheridan will be copying her ex and walking down the aisle anytime soon. During her time away from the limelight, Sheridan worked on a number of smaller gigs, including taking the Hallmark Channel by storm with a slew of made-for-TV movies. These included The Christmas Spirit (Sheridan played Charlotte Hart, a journalist who gets into a car accident and "wakes up in the hospital only to realize that her body is in a coma, but her spirit is very much awake" and not alone), All Yours (single mom and attorney Cass hires Matt as a nanny and discovers love), and Honeymoon for One (in which successful advertising exec Eve Parker breaks off her engagement and goes on a honeymoon solo). Sitting down with Today in 2016 to talk about All Yours, which she wrote, produced, and starred in, Sheridan opened up about the allure of pursuing her passion projects, explaining, "I love being creative, so it's great to take something as a kernel of an idea and then cultivate it and bring it to fruition and be happy with the product." In addition to her more low-key acting roles, Sheridan also made time to focus on her numerous philanthropic efforts. Over the years, she has worked with the Red Cross, Humane Society, Last Chance for Animals, Best Friends Animal Society, The Amanda Foundation, and many more. In April 2009, after five years on the air as one of the original cast members of Desperate Housewives, Sheridan was killed off the show without much pomp and circumstance. Following a cliffhanger in which her character, Edie, crashed her car into a telephone pole and was electrocuted upon stepping out onto the wet road, she was permanently killed off in the first minute of the following episode. While creator Marc Cherry told TV Guide [via ABC] the reason was that "Edie's already slept with most of the guys on the street and has caused about as many problems as she could," Edie herself didn't agree. Sheridan told the outlet, "Somebody up there really wanted her dead. I think whoever Edie represented in Marc's life was somebody he didn't like. And he had a very difficult time distinguishing between fact and fiction." Jump to February 2019 and the actress' fans experienced a case of déjà vu. [SPOILER ALERT!] After less than a year of work on the Dynasty reboot, Sheridan was taken out of the show when her character, Alexis Carrington, was pushed into a fireplace by her long-lost son, TV Line reports. This time, however, Sheridan offered a more touching reason for her departure, telling TV Line, "Working on the Dynasty reboot and reprising the iconic role of Alexis has been thoroughly enjoyable, but the chance to spend precious time with my terminally ill mother is more important to me right now." The ladies of Wisteria Lane did not walk away from the show on the nicest of terms and, given the chance to throw some subtle shade at one of her former co-stars, Sheridan jumped at the chance. Asked about her thoughts on the largest college admission scandal in U.S. history in which Felicity Huffman was accused of paying $15,000 to a company that fraudulently boosted her daughter's SAT scores to help her get into a more prestigious university, the actress didn't mince words. Although she didn't name Huffman explicitly in the interview, Sheridan left little to the imagination about who she was referring to as she told Access, "We don't know the facts, but we could be extremely disturbed by the entitlement, the power, and money that can take away from less privileged, and that to me is disgraceful." She added, "It's troublesome, it's troublesome, because it could change the life path of a child that is deserving."